The Referee, a Norman Rockwell painting, appeared on the cover of The Saturday Evening Post published October 21, 1950. This is yet another favorite of Rockwell collectors, a classic enduring image of the world Rockwell painted. An alternate title for this painting is The Toss. This painting was Rockwell's 265th overall out of 322 total paintings that were published on the cover of the Saturday Evening Post. Rockwell's career with the Post spanned 47 years, from his first cover illustration, Boy With Baby Carriage in 1916 to his last, Portrait of John F. Kennedy, in 1963. This was also the third cover for The Post in 1950. In 1950, there were four Norman Rockwell Saturday Evening Post covers published. The original oil on canvas painting, 49 x 39 inches or 124.5 x 99 cm, is part of the collection of the National Museum of American Illustration. on page 186 of Norman Rockwell, A Definitive Catalogue by Laurie Norton Moffatt. Pristine original copies of this magazine cover routinely sell for big bucks on eBay, when it is offered. And to think it only cost fifteen cents originally! And it was mint condition then, too. This is one of those instantly recognizable images that Norman Rockwell was famous for. 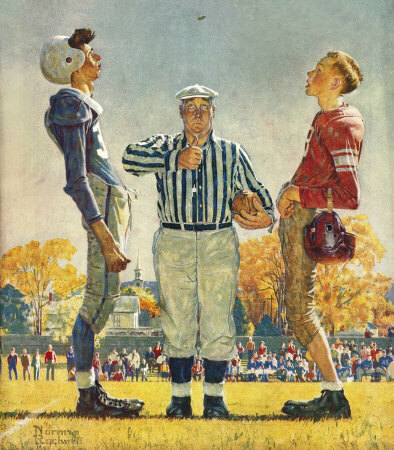 The Coin Toss, as it is somtimes known, is as much Americana as anything that Rockwell painted. Thr time period of the game in question is circa the 1920's judging by the uniforms. The helmet held by the player in the red is a dead giveaway. Both captains are intent on watching the coin that the referee has flipped into the air. Oftrntimes the first posession of the game swings the momentum when the teams are evenly matched. So this seemingly chance event can really impact a close game. The Referee was only one of 322 Norman Rockwell Saturday Evening Post covers; Here is the list of Norman Rockwell Saturday Evening Post cover illustrations. The artwork on this painting looks amost caricatured to me. The characters are not as lifelike as other works that Rockwell painted during the same period. Still no one expects an artist to paint with the same style in every painting . Do You Have A Great Story, Opinion Or Contribution About The Referee?